Toshiba Canvio AeroCast Wireless Portable Hard Drive – this 1TB USB 3.0 external drive allows you to back up everything you need in one place, a central multimedia and backup hub that can be accessed from up to six devices such as smartphones and tablets the same time. 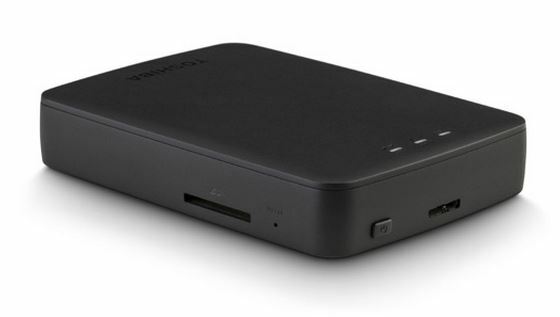 Plus you don’t even need an Internet connection to access content because the Canvio AeroCast Portable Hard Drive creates its own wireless LAN network for devices to connect with. A 1TB capacity plus SD card slot, along with a re-chargeable battery that provides up to 5-hours of wireless data streaming, means the Canvio AeroCast Wireless Portable Drive from Toshiba is highly recommended for both home and office use. Seagate Wireless Plus 2TB Portable Mobile Device Storage – this huge capacity hard drive has it’s own built-in WiFi so you can store all your favourite movies, photos, music plus important documents – then access them wirelessly on all your devices with no internet access needed. This powerful device can stream up to 3 different HD movies to 3 different devices – at the same time! In addition this external wireless hard drive has up to 10 hours battery life and is compatible with all major operating systems including iOS, Android, Amazon Kindle and Windows. Western Digital My Passport 1TB Portable Hard Drive – this 1Tb drive costs from just £60 (or you can upgrade to a 2TB unit for just £78) and the dual interface means you will have a drive with universal compatibility for mobile devices and the future proof technology you need for tomorrow. In addition to the wireless capabilities, you can also use it with USB 3.0 for up to 3x faster data transfer rates. This drive keeps all your important data secure too, with password protection and hardware encryption.